Remember my modeling session the other day, where I said I had a third dress? Well, my human finally cut the tags off so I could wear it for you! She also brought out the hat again, because she thought they would look nice together. Here’s a better look at today’s outfit. Doesn’t this look like it’s out of one of those clothing websites? I love the butterflies on the dress. We’ve had a bunch of butterflies showing up in my neighborhood this spring. Here’s the dress on me… but I know I can get a better angle with it. See? When I’m modeling from the back, you can see the bow and ribbon over my waist. Here is the dress with the hat. I think it is a nice combination, don’t you? I also got to practice my bell ringing when we finished. My human said I didn’t have to wear my hat for that. What a beautiful outfit, Summer. We do love the dress and the hat combination! That dress is really adorable. 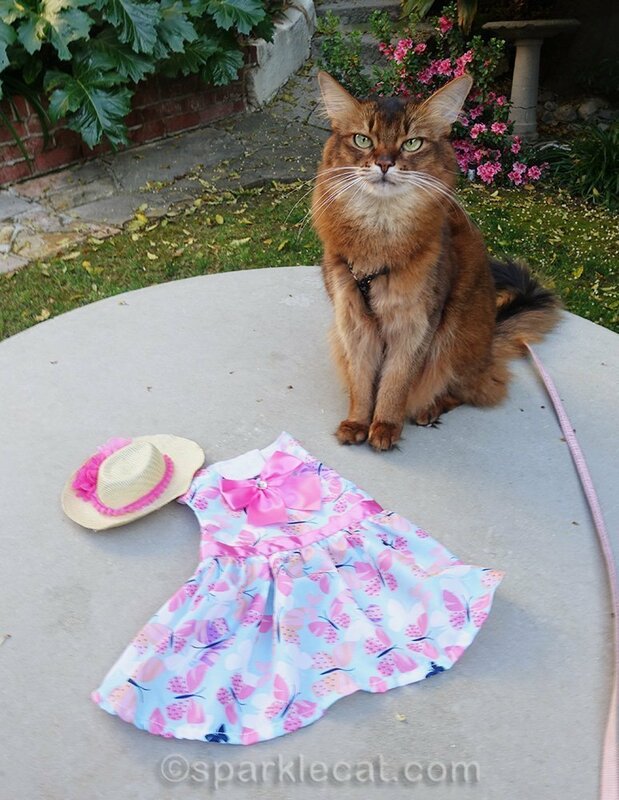 Our human says that dresses as cute as that make her wish Cupcake was more patient about clothing. Great outfit! You’re ready for the Easter Parade down 5th Avenue. In that first pic, your photog made you look fat and I know you’re no fat. That dress is quite fetching, Summer! You’re beautiful. That is a perfect dress for spring! You look very pretty in the pictures where you’re wearing hats! 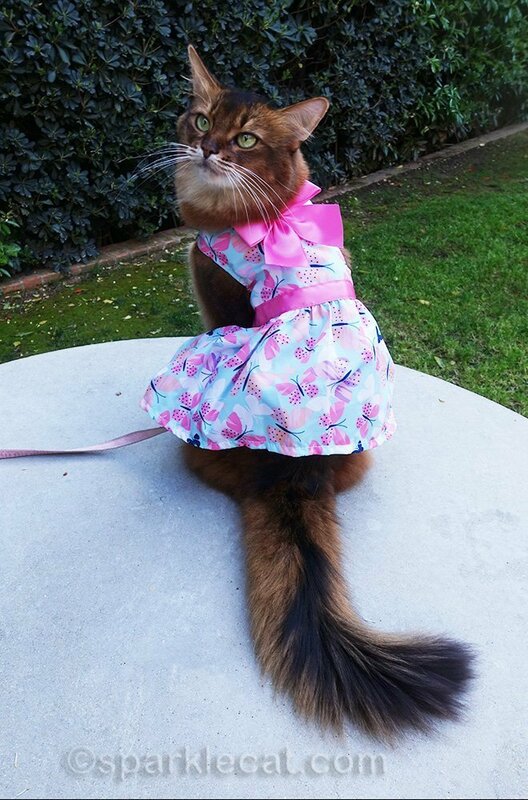 No one rocks spring wear like you, especially with that lovely floofy tail. Now that is one pretty dress Summer. We really like that one and the hat too. You are such a good model. I love the dress and hat together. You are a fashionista. You are just something else, Summer! 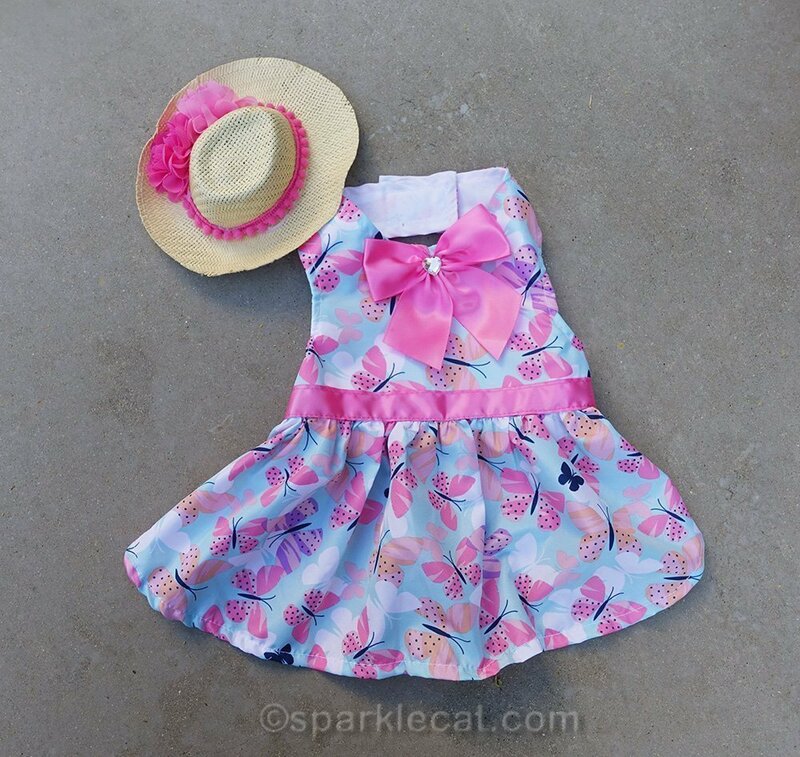 Oh Summer, we think that butterfly dress and hat is one of our favorites now. Pink really suits you dear Summer. Beautiful sweetie! Good job with the bell. Seriously, Summer…you and that wee straw hat are just too cute! Wish I had one in human size; I’d wear it in solidarity with you! And pink is a favorite color of mine. What a lovely outfit! You look so cute! 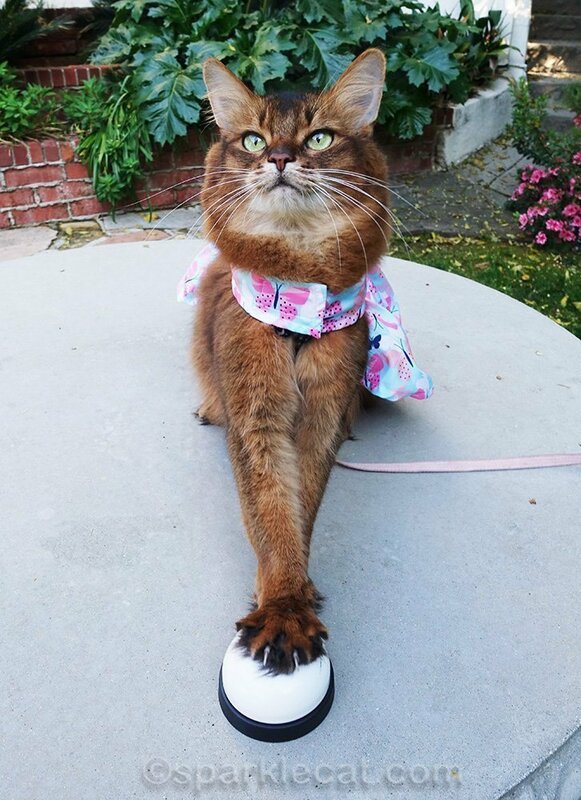 The hat is the purrfect touch. Very pretty,your little straw hat looks lovely with all the new outfits. Very nice Summer. The hat and dress ARE a good combination. butterflies too. You will get a lot of compliments on this outfit. 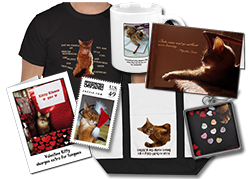 You could certainly be a catalog model. That’s a super pretty outfit sweet Summer, especially with the hat! 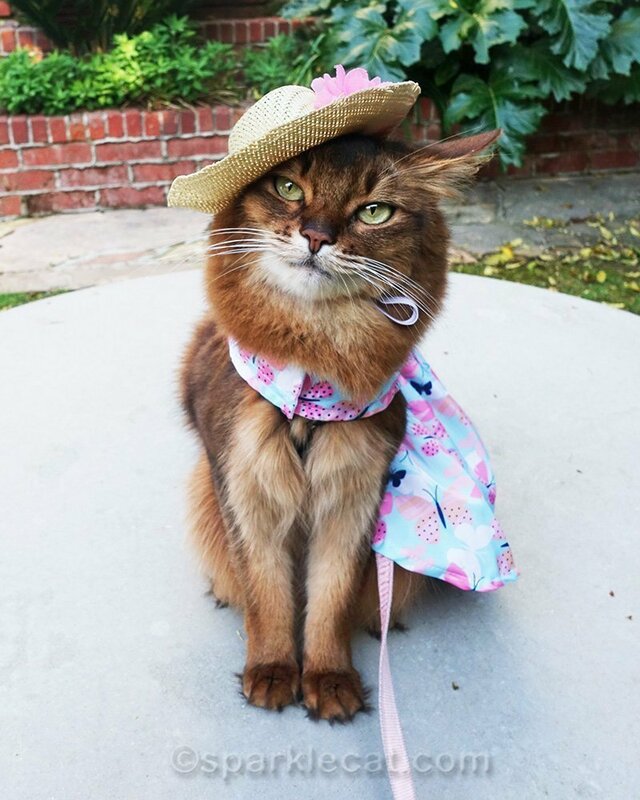 That dress and hat are the purrfect combination, Summer. You should be on one of those fashion websites. OH I LOVE how you look with that beautiful dress and that HAT is perfect with it. You look like a million! Did you go out and show off your outfit? I hope you did? That is a pretty dress, and the back view of you wearing it is lovely. 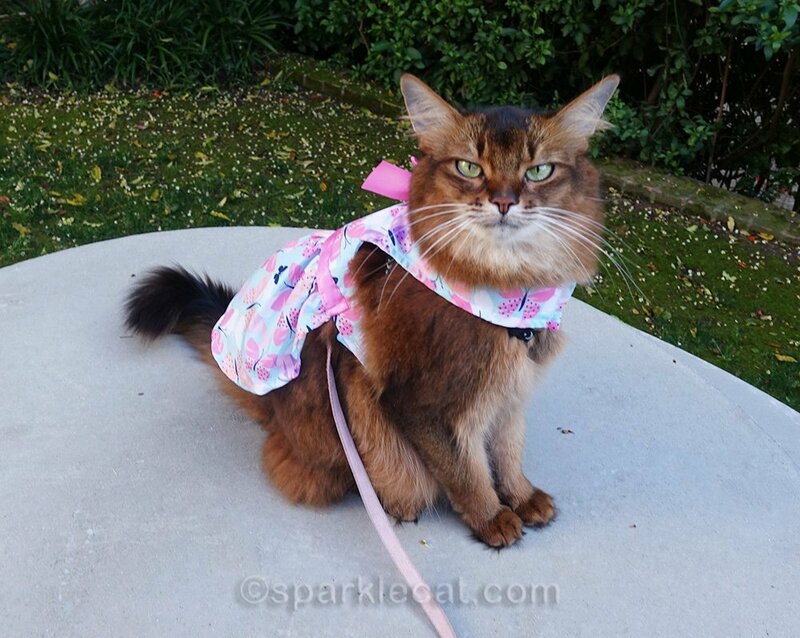 Summer, that really is a pretty dress and it looks very nice on you too! We think you will get a lot of wear out of it too. It are a cute dress and you wear it very well!